Figure 1: AN/TPQ-36 Firefinder weapon locating radar in use by the Austrian Army. 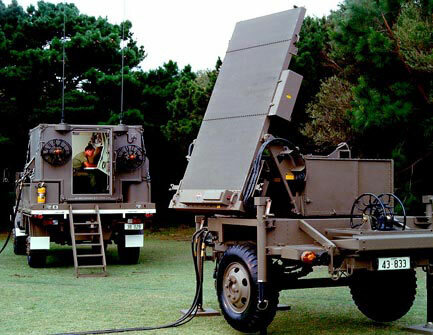 The AN/TPQ-36 is an artillery, rocket and mortar locating radar, designed as a replacement for the AN/MPQ-4 and older technology weapon locating radars. Location of artillery at ranges beyond the capability of the AN/TPQ-36 is provided by the AN/TPQ-37, the other radar that makes up the Firefinder system. Using only a different computer software program, the same operations shelter can be used for either Firefinder radar. Location of hostile artillery and mortars by the AN/TPQ-36 is completely automatic. The system electronically, scans the horizon over a 90° sector several times a second, intercepting and automatically tracking hostile projectiles, then computing back along the trajectory to the origin. The co-ordinates and altitude of the weapon are then presented to the operator. Automatic location is so rapid that the co-ordinates of the firing weapon are normally with the operator before the enemy round lands. In addition to its ability to locate artillery, a number of other modifications have been incorporated. The normal 90° sector can be expanded to as much as 360º for use in insurgency operations. The radar can also provide information on the hostile weapon's target by extrapolating the trajectory to the impact point, allowing the information to be used in the priority of return fire.